The Campaign to Stop Killer Robots is an international coalition working to preemptively ban fully autonomous weapons. Over the past decade, the expanded use of unmanned armed vehicles and drones has dramatically changed warfare, bringing new humanitarian and legal challenges. Now rapid advances in technology are resulting in efforts to develop fully autonomous weapons. These robotic weapons would be able to choose and fire on targets on their own, without any human intervention. This capability would pose a fundamental challenge to the protection of civilians and to compliance with international human rights and humanitarian law. Several nations with high-tech militaries, particularly the United States, China, Israel, South Korea, Russia, and the United Kingdom are moving toward systems that would give greater combat autonomy to machines. If one or more chooses to deploy fully autonomous weapons, a large step beyond remote-controlled armed drones, others may feel compelled to abandon policies of restraint, leading to a robotic arms race. Agreement is needed now to establish controls on these weapons before investments, technological momentum, and new military doctrine make it difficult to change course. Allowing life or death decisions to be made by machines crosses a fundamental moral line. Autonomous robots would lack human judgment and the ability to understand context. These qualities are necessary to make complex ethical choices on a dynamic battlefield, to distinguish adequately between soldiers and civilians, and to evaluate the proportionality of an attack. As a result, fully autonomous weapons would not meet the requirements of the laws of war. Replacing human troops with machines could make the decision to go to war easier, which would shift the burden of armed conflict further onto civilians. The use of fully autonomous weapons would create an accountability gap as there is no clarity on who would be legally responsible for a robot’s actions: the commander, programmer, manufacturer, or robot itself? Without accountability, these parties would have less incentive to ensure robots did not endanger civilians and victims would be left unsatisfied that someone was punished for the harm they experienced. The Campaign to Stop Killer Robots calls for a pre-emptive and comprehensive ban on the development, production, and use of fully autonomous weapons, also known as lethal autonomous weapons systems or killer robots. This should be achieved through new international law (a treaty), as well as through national laws and other measures. We are concerned about weapons that operate on their own without meaningful human control. The campaign seeks to prohibit taking the human ‘out-of-the-loop’ with respect to targeting and attack decisions on the battlefield. The Campaign to Stop Killer Robots has been established to provide a coordinated civil society response to the multiple challenges that fully autonomous weapons pose to humanity. Companies and individuals working on artificial intelligence and related technologies should support the call for a ban and pledge not to help develop fully autonomous weapons. Want to learn more about the campaign? 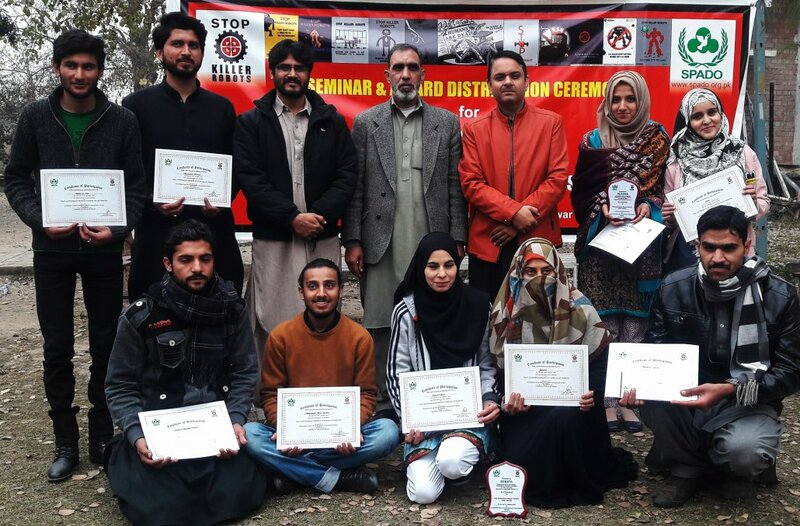 In May 2013, Pakistan became the first nation to call for fully autonomous weapons to be prohibited and it has repeatedly urged the creation of a new international ban instrument on the weapons. Pakistan has expressed multiple concerns with these weapons, finding that they will violate international humanitarian and human rights law as well as lower the threshold for going to war. Pakistan participated in the Convention on Conventional Weapons (CCW) meetings on lethal autonomous weapons systems (LAWS) in 2014-2016. Its representative Ambassador Tehmina Janjua served as president of the CCW’s Fifth Review Conference in December 2016, where states agreed to establish a Group of Governmental Experts on LAWS. Pakistan is not known to be researching and/or developing fully autonomous weapons. Pakistan has issued position papers and articulated its policy approach to fully autonomous weapons, including support for a preemptive ban, on several occasions since May 2013. It is not clear if additional policy measures have been taken in capital on the topic. Representatives from Pakistan’s Ministry of Foreign Affairs have provided the country’s initial views. On the necessary action, Pakistan said, “We believe that the experience with drones demonstrates that once these technologies are developed and operationalised, it is almost impossible to restrict their use. It is, therefore, necessary to impose the necessary restrictions at the earliest possible stage in their development in order to prevent violations of human rights.” Pakistan acknowledged the Rapporteur’s call for national moratoria but said “there is a need to move beyond” them by banning LAWS, providing the precedent of the CCW’s Protocol IV banning blinding lasers. Sustainable Peace And Development Organization (SPADO) is an active member of the Campaign to Stop Killer Robots and has participated in the initial meeting and discussions in London. The organization’s Executive Director Raza Shah Khan is Pakistan’s official spokesperson of the Campaign. Keeping in view the leading position of Pakistan for a preemptive ban on LAWS and Ambassador Tehmina Janjua being the current Foreign Secretary of Pakistan, there is a dire need to initiate a strong and effective campaigning work. 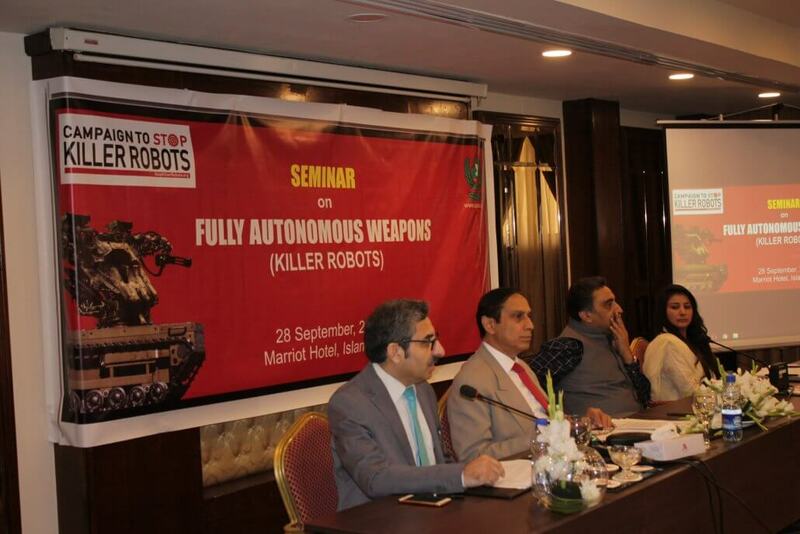 Mary Wareham, Coordinator for Campaign to Stop Killer Robots has already remained in touch with the foreign office of Pakistan and have effectively engaged and appreciated Pakistan’s support of the call to prohibit lethal autonomous weapons systems as soon as possible. She has mentioned in a letter to Ms. Janjua that the Campaign to Stop Killer Robots looks forward to continued cooperation with Pakistan at the national level, and via the CCW and other international processes, as we pursue our common objective of a preemptive ban on lethal autonomous weapons systems. In a letter to Mary in April, 2017, Ms. Janjua has expressed her appreciation of the work of Human Rights Watch and civil society on the issue of LAWS and have offered her support and cooperation in future. Building on the above and previous advocacy work, SPADO planned to utilize the opportunity of the engagement through various activities. A media conference was held at National Press Club Islamabad. Representatives from leading print and electronic media of Pakistan participated in the press briefing. A national level seminar was held inviting and engaging Pakistan Foreign Office, government officials, political leaders, law experts, religious scholars, AI experts, human rights organizations, NGOs, diplomatic missions in Pakistan and a big number of media representatives participated in the Seminar.